Zimbabwe’s Prime Minister Morgan Tsvangirai Saturday apologised for his affairs with two women whom he later dropped in favour of new wife Elizabeth Macheka, saying he did not mean to hurt them. “I know the road I travelled to make this choice has been rough and has been filled with all sorts of trouble, but I am glad I eventually made my choice,” Tsvangirai told 20,000 supporters at a rally, referring to his wedding earlier this month with Macheka. 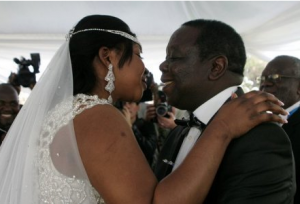 Tsvangirai married Macheka, daughter of a senior official from his rival President Robert Mugabe’s party, in a traditional ceremony, after a woman tried to stop the marriage claiming she was his legitimate wife while another claimed she was engaged to him. A magistrate’s court had granted the request by Locadia Karimatsenga to block Tsvangirai’s marriage to Macheka, prompting Tsvangirai to resort to a traditional marriage which allows polygamy. A high court threw out Tsvangirai’s appeal against the original ruling. A South African woman, Nozipho Shilubane, unsuccessfully tried to block Tsvangirai’s marriage to Macheka, claiming he had promised to marry her.